Head coach Chris Chester has named his 19-man squad for the West Yorkshire derby, with Tupou sidelined by a groin injury. 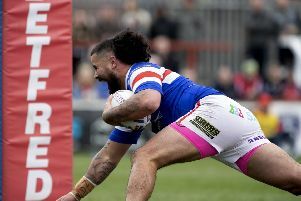 The explosive centre hobbled off the field during the 33-22 win over Salford Red Devils on Sunday. Trinity are still awaiting a full prognosis on the injury, with an update expected tomorrow. Chester already has to make do without talisman Tom Johnstone for the rest of the season while Tyler Randell, Craig Huby and James Batchelor are all out with injury. In more positive news, Danny Kirmond has returned to the 19 after serving a two-game suspension. Wakefield have won their last three home meetings against Huddersfield and were 42-16 victors when the sides met at the John Smith's Stadium in July. Tinirau Arona has made 99 appearances for Trinity and is expected to make it to a century of games for the club. He made his debut against Widnes in February 2016. Ben Jones-Bishop is also in Chester's squad and has scored in each of Wakefield's last three meetings with the Giants. Wakefield's 19-man squad: Tinirau Arona, Joe Arundel, Matty Ashurst, Danny Brough, Jordan Crowther, Anthony England, David Fifita, Ryan Hampshire, Keegan Hirst, Justin Horo, Ben Jones-Bishop, Max Jowitt, George King, Danny Kirmond, Craig Kopczak, Reece Lyne, Jacob Miller, Pauli Pauli, Kyle Wood.